Comments: Often called "antelope" the pronghorn is the only member of the family Antilocapridae. The buck's black horns are forked or "pronged." Females may be hornless or have smaller horns with no forks. The hardened sheath covering of each horn is shed in late winter. A pronghorn's course hair contains air pockets, which provides insulation against the cold. The combination of keen eyesight and their ability to run up to 60 miles per hour allow them to elude potential predators. They rarely jump fences but prefer to crawl under them. They browse in small herds during the summer but form larger herds in winter. Twin births are the rule with does delivering fawns weighing up to 7 pounds in late May or early June. They may live up to 10 years in the wild. Distribution: Pronghorns were found in numbers second only to bison in the Great Plains from Mexico to Canada. Pronghorns are now found in the western quarter of Kansas. 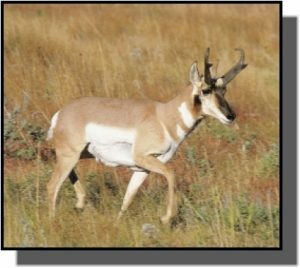 Food: Pronghorns feed on sagebrush, cactus, forbs, and young, tender grasses. For more information, see the GPNC Pronghorn Portrait.